Bongs and fish are two synonymous words. They just love fish and eat in various forms according to their mood. It was raining all day through and its being a rainy evening the bong's heart and taste buds are cribbing for some fish chops. 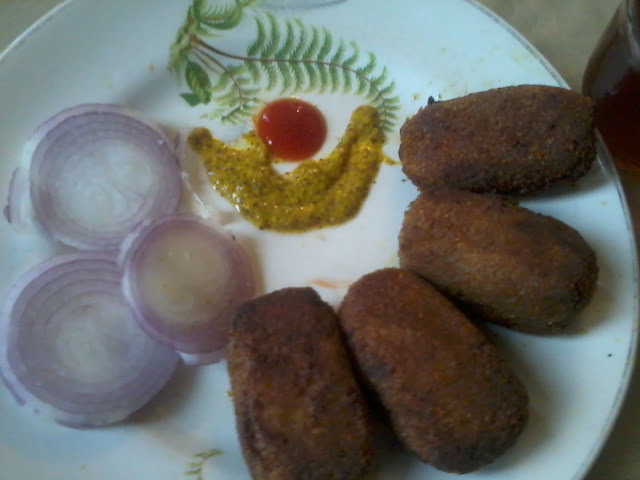 I had few pieces of fish in my fridge and so thought of making this fish chops. They are super easy to make and totally addictive. Just try them and N'joy!! Wash the fish pieces and marinate with salt ,lime juice and turmeric powder for 5 mins. Now boil the fish pieces in microwave for 6-8 mins. Cool, mash and remove the bones thoroughly. In a pan, heat oil and add the chopped onions. Fry them for 5 mins on medium heat. Now add grated ginger, garlic,turmeric powder, red chilli powder, cumin and coriander powder. Fry them nicely so that the raw smell goes off. Next add the mashed fish and potato and fry till the mixture becomes completely dry. Add garam masala powder and allow it to cool. Give them the shape of chops of your choice. In a bowl, add the cornflour with water to make a smooth batter of thin consistency. Dip the fish chops in the batter and roll over breadcrumbs. Refrigerate for at least 30 mins. Heat oil in a wok and deep fry them till both the sides turn crispy brown. Sprinkle some black salt and enjoy with your favourite sauce or chutney. yummy crispy bires, Rita !! lon gitme, no see..how you doing?